I have, yet again, realized that I am different from most people (in my life). Latest difference being that I do not require people I like, to get along with each other. I have noticed that most people (around me) have the need to make sure that everyone they hang out with (or like in general) like each other back. For example my friend would want me to get along with her husband, my husband would like it if I got along with his family, my family would prefer it if I got along with all my relatives, my relatives would be elated if I got along with all their relatives ... may be that's bit of a stretch but you catch my drift. I, on the other hand, am totally fine if two people I am extremely fond of, are not fond of each other much. I have no need for my girlfriend to get along with my husband, or my husband to get along with my family, so on and so forth. It is great, if they do, but they don't it doesn't bother me. The least I expect from people (in general) is to be civil and well-mannered no matter who they are and whom they like (or not). After that I do not really care to indulge in their personal dynamics with each other. I like giving people their space and letting them make their own choices about whom them want in their lives and/or don't. I do not think having me a common link should be a punishment for anyone. The only relationship they need to focus on is with me. Anything else is not necessarily my concern. However, so far I have been a minority with my way of thinking. It does help me stay sane ... and always in my lane. 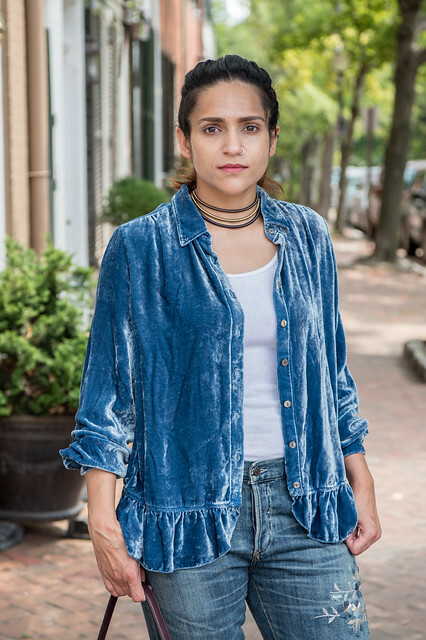 As for this look, it was one of the three I had originally shot for Alexandria Stylebook back in early fall. I had the pleasure of being styled by the fabulous Rosana (via). This was my favorite from the three and I thought I should share it before it is officially winter in a couple of weeks. I feel the same way. It's not necessary for our friends to all get along. Many people come from different backgrounds and have vastly different views, so it's unrealistic to expect them to all gel. I faced this starkly when I started riding motorcycles which introduced me to a new crowd. Most bikers were less educated than my existing friends and had different political opinions. It wasn't necessary (or possible) for me to harmonize them all. P.S., What a pretty top! 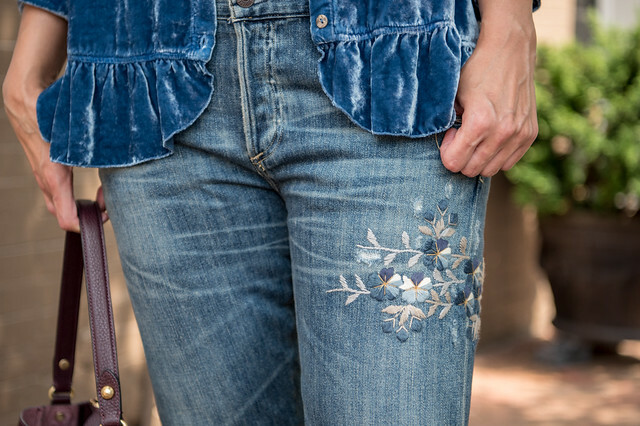 Love the velvet lady, gorgeous! Everyone gels with people differently right? :) Obsessing over that jacket! 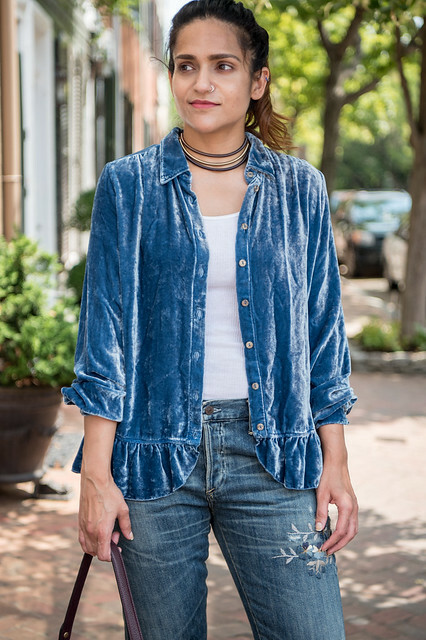 So cool to see a velvet top like this and I love the chokers. Too bad we don't live closer to each other because I actually feel the same way. I never understood how (on reality shows) a girl would always want her girlfriends to like all the people she liked and to hate all the people she hated. I don't get that. I just care that everyone can be civil and act like adults when around each other. For years I didn't like one of my husband's best friends -- and he was in our wedding, lol! My husband knows exactly how I feel about him and we are just civil around each other. I've never really thought about it. It is nice at least if they are cordial to each other. P.s. Love the jeans! That jacket is fabulous. I wish I was more like you in not caring if people I like enjoy each other. It stresses me out way too much and is one of areas I'm hoping to grow in. 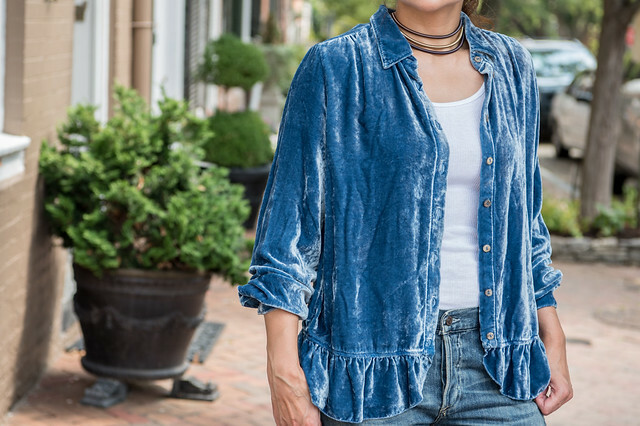 I don't think I've seen a velvet top quite like this one before! It's very lovely! it would be idea if everyone i hung out with got along just fine..but it doesnt happen. it doesn bug me sometimes as there are sometimes weird vibes but as long as they are respectful to each other, im okay with it. That is such a simple thought but so profound! And coincidentally, it came at just the right time. My best friend is getting married and we were just talking about this 'you have to like him!' thing! But I totally agree with you. As long as people are civil and well mannered around me, I dont need them to like me! Great read though.